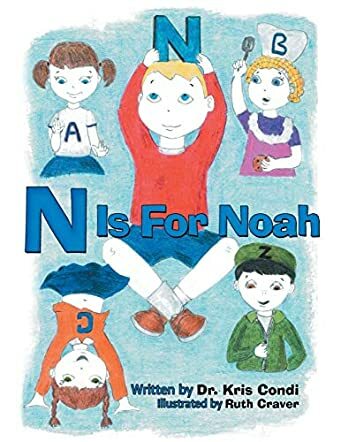 N is for Noah by Dr. Kris Condi is a very unique and different way of teaching the alphabet to children. From Adding Ami to Zipping Zev, this book addresses many layers - domestic, mathematical, social, and environmental issues - with the help of alliteration, short sentences, and fun illustrations. While Adding Ami introduces young readers to arithmetic, Cari Cartwheel, Exercising Emma, Ironing Ina, Nice Noah, and the other letters of the alphabet introduce children to many activities, from that of being physically active, protecting the environment, portraying kindness, and many more. This not-so-typical educational book is a fun and interactive learning experience, filled with adventure and good values. I found the manner in which the author has handled the topic original and refreshing. Every letter of the alphabet has a story connected with it and teaches readers the basic letter sounds. The stories teach them good values and concepts and convey positive messages. The illustrations are adorable and readers will find them charming. It is a good book to teach the alphabet as there is a lot of fun and adventure in each alphabet letter’s story. Parents and grandparents can use it for bedtime storytelling and it is good for interactive learning sessions in classrooms and school libraries. It is an excellent treat for young readers and the author addresses so many concepts through the book, making this a must-read for children. The book is a playful and fun journey for children and the author handles various concepts with ease and expertise, making learning a beautiful experience!